Bulk storage wire cage lockers can be used to store equipment, inventory, personal valuables, and uniforms. XPB Locker Supply has a full selection of lockers in all sizes to fully accommodate the many unique storage needs of different industries. With the right choice in locker model, and the right group configuration, even the smallest of storage rooms can be turned into a secure, efficiently organized locker room. 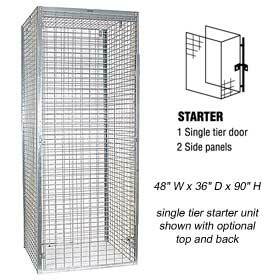 The wire cage design offers a number of advantages over other locker designs. Chief among these is superior ventilation. An open cage allows air to freely circulate from all directions. A panel with slits allows only a minimal air flow in comparison. Another advantage that a cage locker offers is complete visibility into the interior. In some organizations, it is important to monitor the content of personal storage lockers. Security personnel, law enforcement, and management can check wire lockers for possible contraband far more effectively than they can lockers that are closed off to open view. There are many different types of organizations that prefer bulk storage wire cage lockers for these reasons. The retail industry represents one of the largest user groups of wire lockers. Because so many stores now require employees to wear uniforms on the sales floor, it makes more sense to store uniforms in a fully ventilated, open air space. Many of these stores also require employees to store their personal cell phones in their lockers. Managers can quickly find out who may have snuck their phone off in their pocket by simply looking inside the locker without having to open it. Another growing user group of bulk storage wire cage lockers is the public school system. Athletic departments provide students with lockers in which to store their gym clothes, and in which they can store their day clothes during physical education. Gym clothes become very sweaty as a matter of course, so it is far better to provide students with a locker that will allow these clothes to dry after P.E. Also, a dry locker is a much better place for kids to store their day clothes that they will need to wear for the rest of the day. In high risk schools, wire lockers are becoming increasingly popular as a security measure. It is far more difficult for students to store contraband or weapons in lockers that are open to full view than they could in lockers that block visibility. Still other industries, like the repair industry, use cage wire lockers for inventory control. Many tools, supplies, and parts have to be secured to prevent internal theft. Managers can more easily track inventory if they can see into the lockers where they are stored. Any apparent loss can quickly be noticed, investigate, and dealt with in the event that theft occurs. Whilebulk storage wire cage lockers are easy to see into, they are nonetheless very difficult to break into. The heavy gauge steel they are made from is far too strong for a person to bend with bare hands. Simple cutting tools prove ineffective as well, so if anyone does somehow find the hardware and means to break into one of these lockers, the disturbance they create is more than likely going to result in rapid intervention on the part of employees or security personnel. This article was published on Thursday 14 June, 2012.